Want to stop wasting energy fighting with your boots, when all you want to do is get them off and relax? The way it works is similar to a bottle opener. You just put your foot in the opening, positioning your heel back against the Black jack and lift your foot up. That’s it. Kick off your boots and get comfortable. That saying is great and all, but sometimes it’s easier said than done. Sometimes your boots are so tight, it’s a struggle to get them off quickly. The struggle is real! That’s where the Quick & Easy Boot Jack comes in. This handy boot jack lets you easily take off your boots hands-free! We love simple products like this that make our lives easier and more stress free. The Black jack makes a great gift for anyone who wears boots and likes to get them off quickly once home. ?92% of customers buy 2 or more.? ► Some Boots Are Really Tough To Take Off! This boot jack makes it easy to remove all types of boots and shoes with ease! We all have that nice pair of cowboy boots that are great to wear, but impossible to remove without assistance. Nobody likes to step on the heel of one boot with the other and ruin the leather. Fits most sizes of boots and shoes. Easy to use for people of all ages, kids to elderly. Great product. Fast shipping. Thank you. Just what I needed! The opening on this boot jack does in fact accommodate cowboy boots as well as muck boots. The gray rubber grip does its job without leaving a mark on my boots. This device appears to be fairly sturdy, but I’ve only had it a week, so we shall see. I read every darn review and dithered – ordered this and another. This is the best boot jack ever. Removes fairly tight Hunter (brand) rubber boots w/ zero effort. 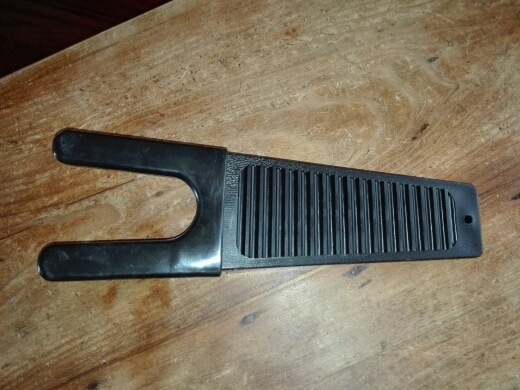 I got one for my husband to use to remove his new boots. Since his back surgery, he isn’t as flexible in bending as he once was and found that he needed a little help. He loves this boot jack so much that I ordered a second one so he can have one at home and one at the office. Oh man these work like a charm. They are lightweight but seem really durable. I’m a 250 pound, 50 year old man. 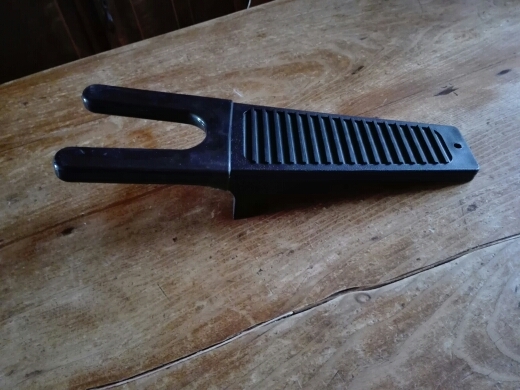 Using this boot jack, I just removed my own cowboy boots for the first time with considerable ease (and without having to ask my wife to help). A great product and – for the price – even if it turns out not be as durable as it seems – I could buy one every year and it would still be worth it. This is AWESOME! Why, oh why, didn’t I look for such a thing earlier? Very effective, seems very sturdy, thick plastic. Would not use on a *very* soft wood floor for fear of marking but harder wood or tile or concrete is just fine. If you can mark up your floor with other household items, you might put enough pressure on this, too, for marks. Of course, your boots might be marking up soft wood, anyway. Not concerned with our house, though, or on an entry mat. Tiny bit wide for small kids boots, but they might like to try, with an adult standing on the ridged portion to help them balance. Works okay on big kid rain boots, operated alone. Great for adults – as in why did I not buy this a few years ago! No more struggling with soggy, salty boots after treking to a seat nor asking for help with the Bogs garden shoes that work so very well until it’s time to take them off. Problem solved!